Events The Es Recó de Randa team has extensive experience in all types of events. Es Recó de Randa offers different interior and exterior spaces for events and meetings. We adapt our customers’ needs, organising the setting up our exclusive, air conditioned areas that are equipped with the latest technologies. We have the infrastructure and knowledge to organise weddings, meetings and events. We help you create a tailored experience, taking care of every detail. We have meeting rooms that are perfectly equipped for meetings, conventions, incentives, family dinners, weddings, christenings and communions. Rooms with WIFI connection, screens, projectors, coffee breaks for companies. See our range of menus for groups or customise the menu to your liking. All with the guarantee that we offer from the experience gained from years of work. 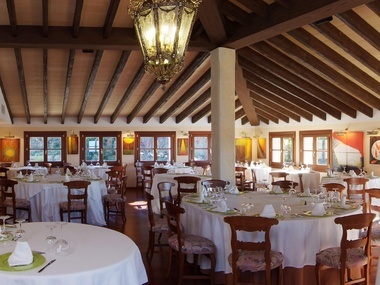 At 15 minutes from the airport and 25 minutes from Palma, the Es Recó de Randa Hotel offers comfortable facilities in a unique environment that make it an ideal place to hold all kinds of events, business meetings or conventions. An excellent place for your most special moment. Allow our captivating surroundings, exquisite gastronomy, facilities and our human team, make your day magical and unforgettable.